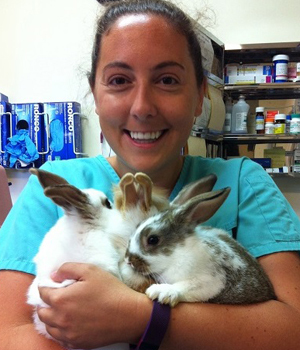 Andrea graduated from the Veterinary Technology program at Seneca College in 2013 and comes to Campus Estates with a varied background including wildlife and zoo medicine. Andrea has worked with everything from Yorkie puppies to polar bears and has special interest in exotic medicine. She enjoys building upon her skills and knowledge in this constantly changing niche and admits to having a special passion for rabbit medicine. When she isn’t working, Andrea loves spending time outdoors hiking, camping, and travelling. Her partner, Cailen, their lion head rabbit named Benjamin, and Boston Terrier named Dexter (who has too much personality for his own good, at times) all keep her company at home.